Portland’s Knack Factory has produced a series of videos on Civil Rights Through Art & Law, our summer 2016 partnership with the University of Maine School of Law and Portland Museum of Art. 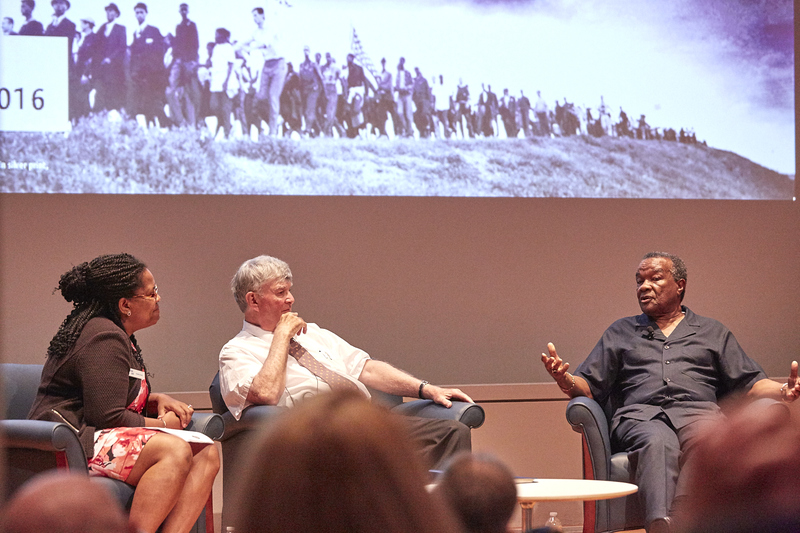 As part of The 14th Amendment in American Life and Imagination, the MHC’s statewide programming that explored concepts of equality, citizenship, and liberty, Civil Rights Through Art & Law featured National Humanities Medal-winning artist David Driskell and renowned civil rights attorney Melvyn Zarr (University of Maine School of Law). In an intimate conversation facilitated by Danielle Conway, Dean of the University of Maine School of Law, Driskell and Zarr discussed art, the law, and their lifelong work in activism and education. As we celebrate Black History Month, let’s look back on Civil Rights Through Art & Law and the MHC’s statewide programming exploring the historical and contemporary significance of the 14th Amendment.